BOSTON — Chris Davis definitely kept the souvenir ball from this most elusive hit. 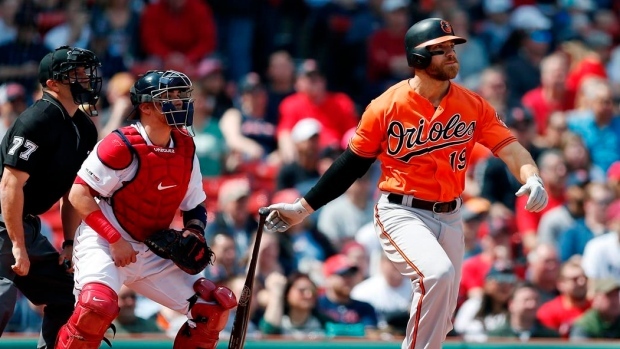 Davis ended his record slump at 0 for 54 and drew applause from rival fans at Fenway Park, lining a single and two doubles while driving in four runs as the Baltimore Orioles beat the Boston Red Sox 9-5 Saturday to stop a four-game losing streak. "That's a long time without getting a hit," he said. "I don't know what I'm going to do with it, but obviously something special." Davis broke into a smile when his bases-loaded, two-run single in the first inning broke the drought. "It meant a lot to me," he said. He tried to make the most of his terrible stretch. "I said it a couple of weeks ago: 'You have to embrace it at some point,'" he said. Davis walked to the plate in the first to what mostly appeared to be mock cheers when he was announced. But many of those quickly changed when he hit a liner over the head of second baseman Dustin Pedroia, ending the longest hitless streak ever by a position player. It was his first hit since Sept. 14 of last season. Once he safely reached first, Davis tipped his cap to the Orioles dugout and many of his teammates raised their arms and hollered in support. He smiled and made a motion that he wanted to ball, which he got. "Significant weight lifted off my shoulders," he said later. Davis, a two-time major league home run champion, had been 0 for 33 this season. "The team did a rally around him a few minutes ago and a couple of guys said a couple of nice things," Baltimore manager Brandon Hyde said. "We know how hard he's been grinding. We know how hard it's been on him. Our guys have been pulling for him big-time." The 33-year-old Davis is in the fourth season of a $161 million, seven-year contract. The all-time record for a hitless streak by any player was an 0-for-85 drought by pitcher Bob Buhl in 1962-63. "It's never easy. Baseball is a tough game when you're struggling," said Boston righty Rick Porcello, who gave up the hit. "He's still showing up and playing hard every day, so I tip my hat to him for battling through what he's battling through." Davis lined an RBI double in the fifth that put the Orioles ahead 3-2. The Orioles broke it open four in the sixth, with Davis adding a run-scoring groundout. Christian Vázquez hit a two-run homer and drove in a career-best four runs for the World Series champion Red Sox, who had won their last two games. Andrew Cashner (3-1) gave up three runs on three hits in five-plus innings. Porcello (0-3) pitched into the fifth. Orioles: C Pedro Severino was in the lineup after having Friday off. He was hit in the head by a curveball from Oakland RHP J.B. Wendelken the day before. Red Sox: Manager Alex Cora said LHP Brian Johnson (left elbow inflammation) still hasn't thrown and is just getting treatment. . Pedroia returned after getting Friday off as the club proceeds slowly after he missed all but three games last year due to a knee injury. Porcello had allowed 16 runs — 11 earned — over 7 1/3 total innings in his first two starts. He gave up three in four-plus innings Saturday. "He's healthy. He's good. Everything is good," Cora said. "It's just not working right now for him. He's erratic in the zone." The top four Red Sox starters: Chris Sale, David Price, Nathan Eovaldi and Porcello fell to 0-7 with an 8.43 ERA. Boston RHP Marcus Walden and 1B Steve Pearce both committed an error in the same inning. Third baseman Rafael Devers also bobbled a grounder, but threw Dwight Smith Jr. out at second after he rounded too far. Orioles: LHP John Means (1-1, 2.08 ERA) is set to start Sunday. Red Sox: LHP Price (0-1, 6.00) is slated to make his home debut.